In the years following the spread of Christianity throughout the Roman Empire there was much persecution of the followers of the Way. They frequently buried their dead in catacombs, called 'cemeteries' or sleeping places. It was in these hundreds of miles of underground passages that some of the first recorded Christian art is to be found. The purpose of these very simple scenes was to instruct and inspire at a critical time in the life of the Faith. They concentrate on famous Bible stories and hold out a promise of salvation, hope and deliverance. Death is not the end: the true destiny of the human race is beyond the present world. The image above depicts a scene from the book of Daniel. When King Nebuchadnezzar of Babylon erected a huge statue and ordered everyone to worship it, three Jewish officials refused to do so, mindful of the commandments (Exodus 20). They were thrown into a furnace as a punishment. As the king watched them thrown into the flames he was astonished to see them joined by a fourth figure. He called them out, recognizing the intervention of God, and ordered that this God should be respected. He believed the fourth figure to be an angel. The painting is so simple it is almost childlike and consists of very few brush strokes. The three figures are in almost identical Persian dress; the flames couldn't be more economically indicated. The only other symbol is that of a dove. By pausing before the picture and recreating the darkness of the cave in which it was found, its message becomes not only clear, but powerful. The early Christians who saw it knew only too well the dilemma of Sadrach, Meshach and Abednego, for they were threatened with a similar punishment if they didn't acknowledge the Roman Emperor as divine. The three figures look directly at us, their hands raised in the typical praying (orans/orant) position of early Christian art and the flames are ineffective, almost incidental. The dove symbolises God's help and presence. He has come alongside them in their tribulation. There is a solidarity in the fellowship of the three with their hands interlinked, which the Holy Spirit makes possible and reinforces. It may not be that the early beholders would escape death, but they knew that in and through God's presence and help they would know eternal fellowship and communion. Like so many events depicted by early Christians this was seen as a type of resurrection. They recast Old Testament stories in the light of the resurrection of Christ, which was their single cause for hope amidst persecution and oppression. This meditation has been published in: Keith J. White, Masterpieces of the Bible: Insights into Classical Art of Faith, Baker, 1997 / The Art of Faith: Story of the Bible Through the Eyes of Great Artists, John Hunt Ltd., 1997. 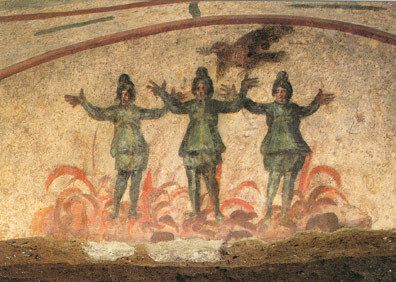 The Three Men in the Fiery Furnace, wall painting from the Priscilla Catacomb, Rome, 3rd century.